I was just on yesterday and already another post crazy hey. 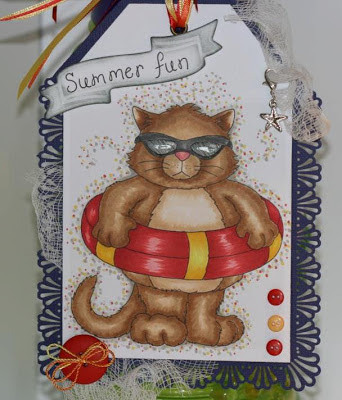 Well this is a tag that I made cause the challenge for this month on the Whimsy challenge blog is a shape card. Well I made a tag. 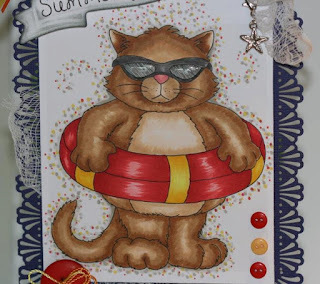 I thought it would be fun to use this super cute image from Whimsy Stamps called Cool Cat's Life Saver digital stamp from designer crissy. I love this little cutie, it was super fun to work with as well. I went to a local store to try to find something to put this tag on. I really wanted a sand pail and shovel etc. Well I couldn't find anything that would match the tag I made so I went with bubbles. 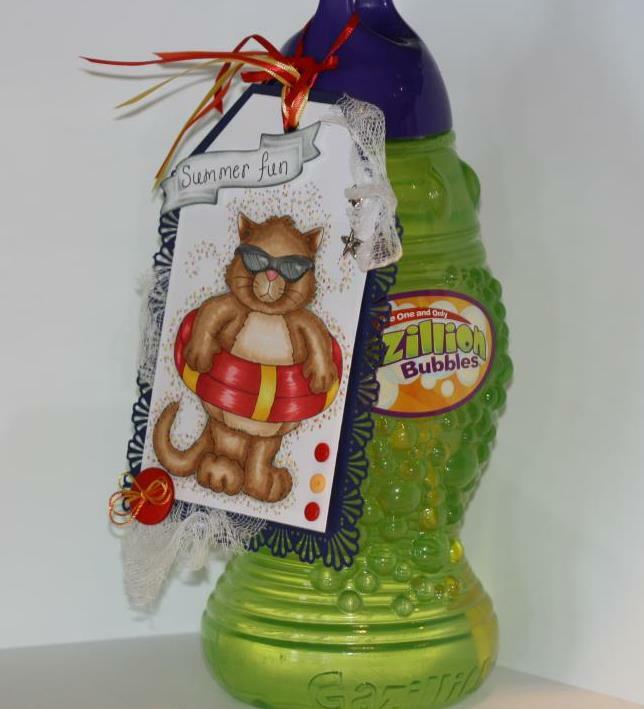 I hand wrote the saying on the tag summer fun, and really what kid doesn't like bubbles. I think I'll give this away as a gift. I really loved doing this challenge cause I really got to step out of the box. I would love for you to create something and add it to the Whimsy challenge( click here to jump over to the challenge blog) to get a chance to win some wonderful digital images. Think about it and go create a super wonderful project to win some great images. Hope to see what you have created. Here's my tag and a huge container of bubbles. Hers cool cat's Life saver image, colored with copic markers. A bit closer look at my colored image. I added little dots around the outside of the colored image to help accent the image. I also used glossy accent by ranger to give the glasses a reflective look. and of course the bubbles. Supplies: copic markers, Bazzill cardstock, Martha stewart coner and edge punch, tag spellbinder, Basic grey buttons, Cheese cloth, miscellaneous charm, ribbon. super cute,thank you for joining us at Cupcake this week and good luck. Awesome Summer Fun, thanks friend for playing our challenge! Way to go, super cute, love the image and the coloring! Wahoooo! Fantastic tag hun and thank you for popping by mine and leaving such a sweet comment on my challenge card recently...means a lot!! 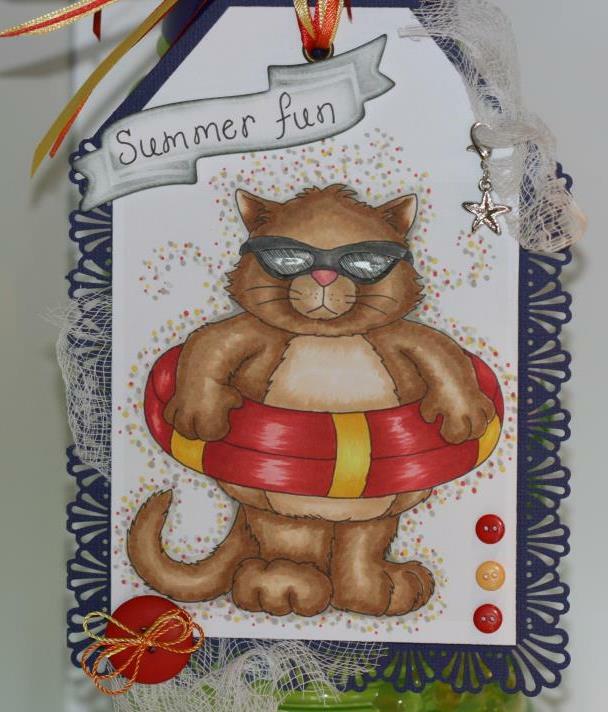 Adorable tag with a great summer theme!! Thanks for playing with us at One Crazy Stamper and good luck in the challenge!